'Tis the season of giving. Which means it's time for another giveaway! 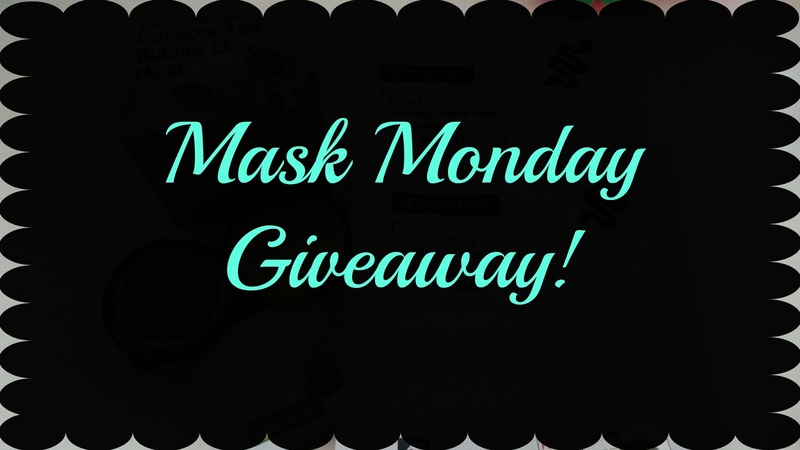 Mask Mondays are an important part of this blog as we like to share the many masks we've tried and our reviews on them. We try a lot of masks because we are mask lovers. 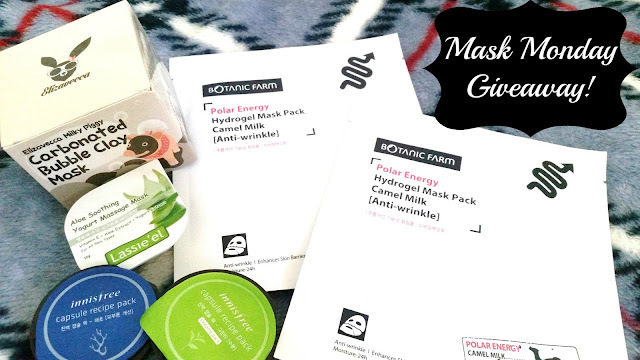 And as mask lovers, we wanted to share with you some of our favorite masks that we have reviewed in the past. - One Elizavecca Milky Piggy Carbonated Bubble Clay Mask. 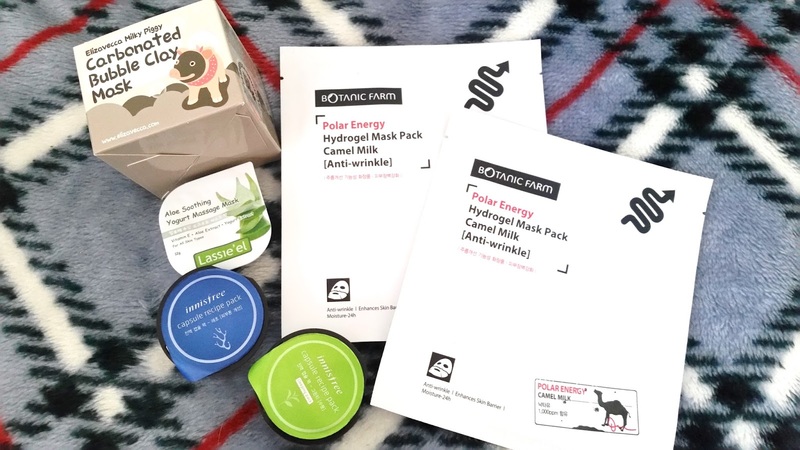 - Two Botanic Farm Polar Energy Hydrogel Mask Packs (Camel Milk). Great hydrogel masks that moisturizes, brightens, firms, and add suppleness to the skin. The masks are formulated with Camel milk which is an ingredient known to help the skin lock in moisture. It can also help with reducing fine lines as well. Read more about it here. - One Innisfree Capsule Recipe Pack in Seaweed. - One Innisfree Capsule Recipe Pack Sleeping Pack in Green Tea. Innisfree's Capsule Recipe packs comes in 2 types, wash-offs and sleeping packs. Unlike the Seaweed one mentioned above, this Green Tea pack here is part of the sleeping pack line. The Green Tea Capsule sleeping pack is just like its larger counterpart by the same name (Green Tea Sleeping Pack). So, it's a great option for those who would like to try a small version before buying the whole thing or for those who wants to travel with them. We fell in love with the Green Tea sleeping pack as the formula is not sticky and absorbs nicely. The mask provides good moisture to the skin and leaves the skin feeling supple as well. Our full review here. -One Lassie'el Aloe Soothing Yogurt Massage Mask. Another one of our well liked wash-off mask is this Aloe Soothing Yogurt Massage mask by Lassie'el. One little packet can last for multiple uses which is nice. We like that it feels soothing on our skin when applied. Unfortunately, it's super hard to find, in terms of purchasing it locally or via the internet. But we've included it in the giveaway package so our lucky winner can give it a try. Review here. The Mask Monday giveaway package is curated by Dreams To Creations. Retailing over $30. The giveaway ends on December 1, 2015 at 11:59pm PST and one winner will be selected at random by Rafflecopter. Good luck beauties. May the odds ever be in your favor! Disclosure: This post contains some affiliate links which helps to support the blog. Read our full disclosure statement here.